The camera pulls up on a crane for a mass shot of thousands of Bhangra and Ghoomar dancing undead. At the end of the opening number streams of shamblers leave the massive courtyard and we focus on one man who hasn’t quite died as he pushes through the crowd. He is confused but steadfast and like all the others around him wears white with a predominantly red overtone. Okay, no not really – but I would watch it. The Ford brothers, who wrote and directed The Dead have again set a zombie movie in a totally unexpected place. Last time it was Africa, this time it is India. I was excited to stop here on my Zombie World Tour, and wasn’t disappointed. The movie actually starts with a shot of colorful people digging industriously in the dirt, with good mood setting music. With the stage set, they quickly introduce the zombie menace with a dash of social media and a pinch of staggering patient zero (fresh off the “African Goddess” cargo ship), and our plucky hero who is pining for the woman of his dreams. She’s stuck at home in Mumbai, though, and can’t tell her father she’s in love with a white man. Before you know it, this massively populated country is in the throes of a zombie apocalypse. A massive population means massive numbers of roving brain munchers. One of the reasons The Dead was so good is they used the setting to good advantage. There is no hiding from the zombie horde in the predominant mud huts of the African countryside, so the threat was constant. I expected massive hordes of undead in India, and wondered with what clever means they’d deal with it. Well, they kinda didn’t. 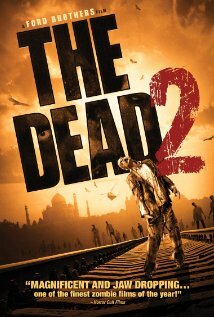 The Dead 2 is a good zombie movie and I enjoyed watching it, but it’s not quite as good as their first effort. The hero is again paired with a stranger working his way in the same direction so why not band together. As before, there is a lot of open space to be traversed somehow without reliable transportation, although the modes of travel are varied and exotic. And the land itself proves to be as dangerous as the walking dead. The brothers continue to philosophize over the nature of the unnatural plague. In The Dead the cause was a mysterious virus, and in The Dead 2 it is hinted to be caused by a crisis of faith. Either way, the moral is we brought this on ourselves so we’d better just deal. You do that by taking responsibility for your actions, understanding the importance of life and most importantly, following your heart. The Ford brothers said in an interview they took their show to India because it is a spiritual and beautiful country, and they wanted to mix those elements with horror. I think on the whole they succeeded, and I recommend this go on your queue. Our hero does make it to Mumbai after finding a gun and a handful of shells to deal with the not-quite-a-multitude of undead along the way. At one point, he must do the responsible thing (one of the themes) and it needs two bullets. They make a point of showing he only has three left – one for him if needs be and the others for the problem at hand. It was right about this time, though, that he began to seem invincible. There were too many tight spots with him mano a mano with multiple zombies and nary a bite, and then when he finally hits the mother lode of undead in the teeming slums his pistol goes all French on him and never runs out of ammunition. That and the inflexible Indian father stereotype were the things that bothered me most.